As reported by Deadline, Legendary Pictures has decided to move its King Kong prequel/spinoff/reboot/curated basket of snacks Skull Island from Universal to Warner Bros. for distribution. But wait! Don’t go just yet, because this isn’t painfully dull insider garbage that nobody who isn’t in The Industry would ever care about. This move, at least according to Deadline, is all about laying the groundwork for an eventual all-star monster throw-down between King Kong and Godzilla—a rematch of their fight from the early ‘60s. Gareth Edwards’ 2014 Godzilla movie was also produced by Legendary Pictures, and it was distributed by Warner Bros., so the idea is apparently that the studios thought it would be “easier to have all the pieces under one roof” if they ever decided to combine them. (Which they will.) 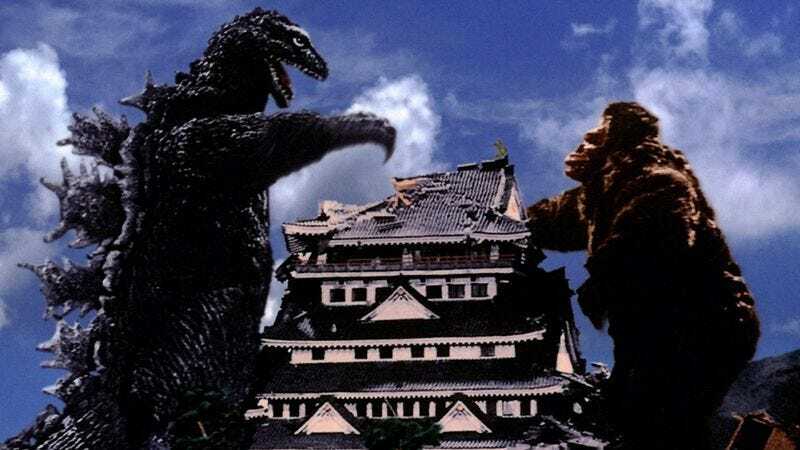 Plus, it sounds like the plan isn’t just to get all of the rights lined up, but that Warner Bros. wants an eventual King Kong/Godzilla fight movie to fit within the established worlds of Skull Island and the 2014 Godzilla. So, in other words, this is more than an all-star monster throw-down, this is the birth of a brand new cinematic universe. Now, we don’t even work for Warner Bros. and our eyes still turned into dollar signs at the thought of another cinematic universe, but that being said, the basic premise of this doesn’t make a ton of sense. The monster in the 2014 Godzilla was hundreds of feet tall, but King Kong is canonically “small enough” to climb the Empire State Building. If this Godzilla fought pretty much any incarnation of King Kong, he would almost literally squish him to death. Then again, the movie is basically guaranteed to make some good money, so it doesn’t really have to worry about logic. It just needs to worry about monsters punching each other. The existence of this new King Kong Vs. Godzilla movie is still far from being officially confirmed, so this won’t necessarily happen, but it easily could now that both monsters are under Warner Bros.’ roof. Either way, Skull Island has to come out first, which it will do on March 10, 2017.